The Tiny Colored Dots That Give Old Comic Books Their Iconic Look Are Called? 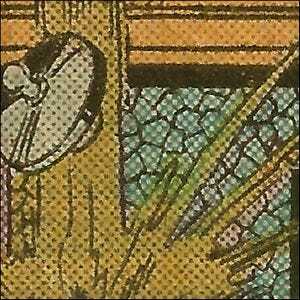 Even if you had no idea what they’re called, you’ve likely seen them at some point: the tiny colored dots that make up the color portions of a comic book panel (and numerous other cheaply printed materials throughout the 20th century and even today). The dots are called “Ben-Day dots” in honor of Benjamin Henry Day, Jr., the late 19th century illustrator and printer who invented them. He created the technique in 1879 as a way to create areas of color in prints while minimizing the amount of ink used. The uniformly sized dots were applied using screens that could be shifted slightly so that the dots stood out separately on white backgrounds, overlapped slightly, or covered each other completely in order to create the illusion of different colors when seen from a regular reading distance. Any curious kid who pored over the pages with a magnifying glass, however, could tell you that when viewed up close, the dots were very distinct—as seen here in a closeup view of a panel in Defenders #49, a Marvel Comics publication from July 1977. In addition to their role in comic printing throughout the 20th century, Ben-Day dots also played a very high profile role in the art of American pop artist Roy Lichtenstein—best known for his iconic and bright paintings that used an exaggerated and enlarged Ben-Day dot system to parody the style of comic strips.